Blog-friend Dr Timothy Furnish covers most of what I’d wanted to say about the final section of the Mahdist video I’ve been on about lately [1, 2, 3] — its last section is largely devoted to footage of jihadists-in-training — so I’ll save myself time and effort and simply drop in five (of Tim’s thirteen) paragraphs that deal with the video below… But first.. The video which Tamerlan Tsarnaev favored specifically draws upon this tradition — which, again, is not particular to al-Qaeda [AQ] but, rather, is part of the entire Sunni world’s patrimony. (The Twelver Shi`is, while believing even more fervently in the Mahdi, have different hadiths and beliefs about him — most notably, that he has already been here as the 12th Imam descended from Muhammad, disappeared but never died in the 9th c. AD, and will return, perhaps soon). This video — almost the entirety of which is backgrounded with a soundtrack of Arabic Muslim chanting — is entitled “The Emergence of Prophecy: Black Flags from Khorasan” and opens, unsurprisingly, with the flag (or banner) in question: a jet-black one emblazoned in white with the shahada, the Islamic “profession of faith” which says “there is no god but Allah and Muhammad is his messenger.” This is followed by slow-motion clips of marching jihadists with AK-47s as the voice over by Imran Hosein Nasr — a prominent cleric who opines often on Islamic eschatology and Mahdism — warns that “they demonize as a terrorist anyone who supports Allah.” A disclaimer then appears, cautioning that “the Muslims pictured herein may not be the people of prophecy” but rather images (or, presumably, types) thereof as well as that some of the sourced hadiths are authentic, but some are weak. (Hadiths are classified, by Muslim scholars, as: sahih, “verified;” hasan, “sound” but not certain; and da`if, “weak,” and quite possibly fabricated.) A hadith from Abu Huraira that “great wars will occur” is illustrated with shots of what appear to be U.S. airstrikes on Iraq. 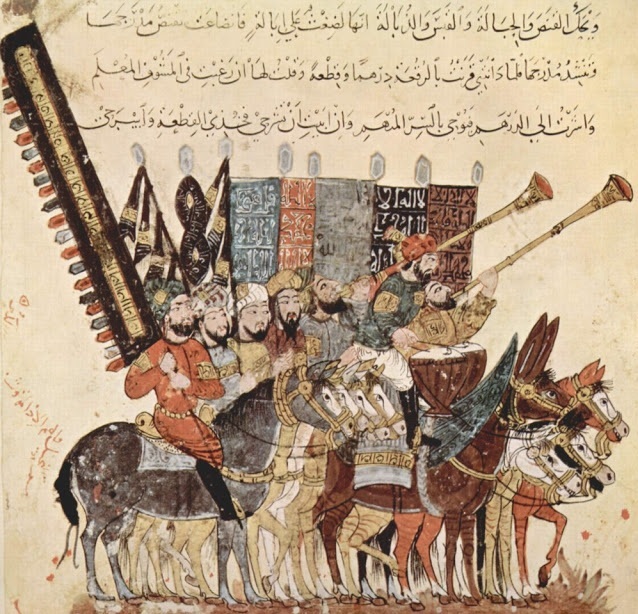 Ibn Majah’s hadith that “Allah will raise a non-Arab army with better weapons who are better riders” is then adduced, followed by a gloss that these will conquer “Constantinople.” Since a great non-Arab Muslim army already conquered that city in 1453 — the Ottoman Turks — one is hard pressed to see how this “prophecy” is still to be fulfilled. Then a hadith from Muslim b. al-Hajjaj is cited: “some will come from the east who will make the caliphate … easy for Imam Mahdi,” as well as one from Ibn Hanbal advising that “if you see black banners from Khurasan, go to them because the Mahdi will be among them.” This is followed by several minutes explicating, with maps, Khurasan as an area encompassing eastern Iran, western and northern Afghanistan, as well as portions of Turkmenistan, Uzbekistan, Tajikistan and, most notably for the Tsarnaevs, Kyrgyzstan (but not, at least, Secretary of State Kerry’s “Kyrzakhstan”). In perhaps the same vein, al-Hajjaj is cited to the effect that Jesus will join the Mahdi’s ranks. This is illustrated with a (pirated?) clip from the movie “The Passion of the Christ” — namely, the scene where Jesus saves the woman caught in adultery, a rather counterintuitive choice. Following Jesus (or at least his sandal, which is all we see), clips resume of marching jihadists brandishing weapons and carrying the black flag. Then a hadith from al-Tirmidhi is proffered, to the effect that these black banners will, eventually, reach Jerusalem; curiously, however, the Dome of the Rock rather than al-Aqsa mosque is shown. This is immediately followed by the hoary video, from shortly after 9/11, of AQ jihadists running an obstacle course in their Converse, embellished with more Imran Hosein Nasr voice-over, asserting that “no one can stop that jihad. When you see that army coming from Khurasan, [like] the Prophet said, go and join that army — even if you have to crawl over ice.” Then a smorgasboard of jihadist eschatological imagery follows: Taliban or Uzbek tribesmen on horses; black banners; jihadists praying with weapons shouldered. As the video winds down, an unidentified, black-clad, bearded Muslim — likely intended as a Mahdist figure — intones “the flags from Khurasan are on their way. Allah will honor his religion and demean the disbelievers. History is repeating itself, as with Muhammad conquering [pagan] Mecca. The polytheists hate it.” (Polytheists, in this Islamic worldview, include Christians — for the Trinity is mischaracterized as three deities.) The very final screen shot informs the viewer that the “real undercover enemies” are the Illuminati, the Freemasons and the New World Order. Furnish titles his HNN post — which I recommend you read in full — The Ideology Behind the Boston Marathon Bombing. It’s not entirely clear to my eye whether that ideology (for Dr. Furnish) is Islam as a historical phenomenon, contemporary political Islamism of the jihadist kind, or its specifically Mahdist expression — I believe he sees all three as intricately inter-related. That’s an extremely nuanced issue, and not one that can be fully addressed by either one of us in a single blog-post, as I think Dr Furnish would agree. By way of showing that Islam by no means begins and ends with the Tsarnaev brothers, I’d suggest you also read playwright Wajahat Ali‘s I am not the Tsarnaevs. The reality is that Islam is as varied as the people, places and times in which it is practiced. Christians too, in times past, had their Crusaders — and their St Francis. One other article appeared recently that I’d like to draw your attention to. JM Berger, another friend of this blog, has an important extended piece on Chechnya-related radicalism in Boston over several decades, now up at Foreign Policy: Boston’s Jihadist Past.